This Moroccan chicken recipe is sure to excite your taste buds. 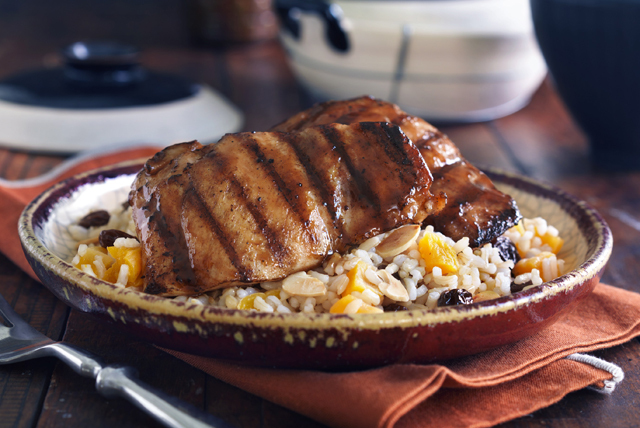 It's so easy - while grilling the chicken, your rice is cooked alongside in a foil pack. This mouthwatering chicken recipe is something the whole family is sure to enjoy! Mix dressing and cinnamon until blended. Spoon rice onto centre of large sheet of heavy-duty foil; top with fruit. Fold up all sides of foil to form rim. Pour water and 2 Tbsp. dressing mixture over rice. Place on barbecue grate; grill 15 to 18 min. or until rice is tender. Brush chicken with remaining dressing mixture. Place on barbecue grate next to rice mixture. Grill chicken 5 to 7 min. on each side or until done (165ºF). Spoon rice mixture onto platter; sprinkle with nuts. Top with chicken. Substitute your favourite dried fruit, such as dates, for the dried apricots. Prepare using boneless skinless chicken breasts.